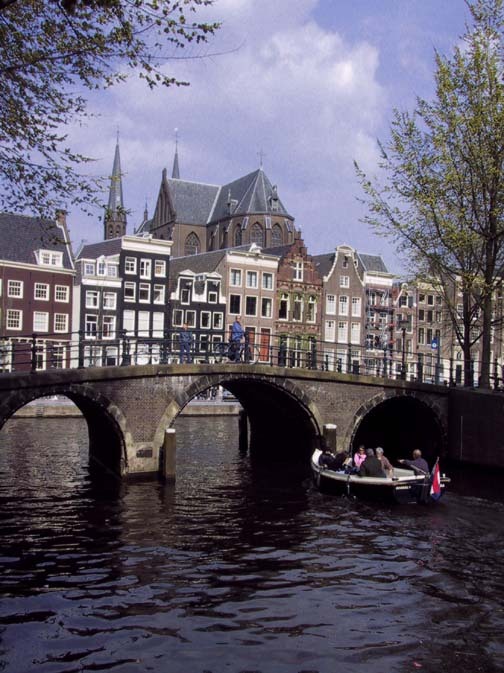 This is a pretty common scene around Amsterdam. In order to get around more quickly, Cheryl and I rented bikes while we were in town. We spent 85% of the time appreciating the scenery...and the other 15% panicking for our lives trying not to get plowed down by other bikes, cars, or trains. 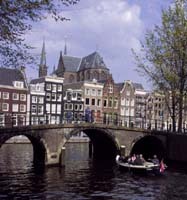 Bridges with cafes on them are also common scenes throughout Amsterdam. Around early afternoon, these cafes become very crowded with people sitting out having a drink and enjoying the weather. 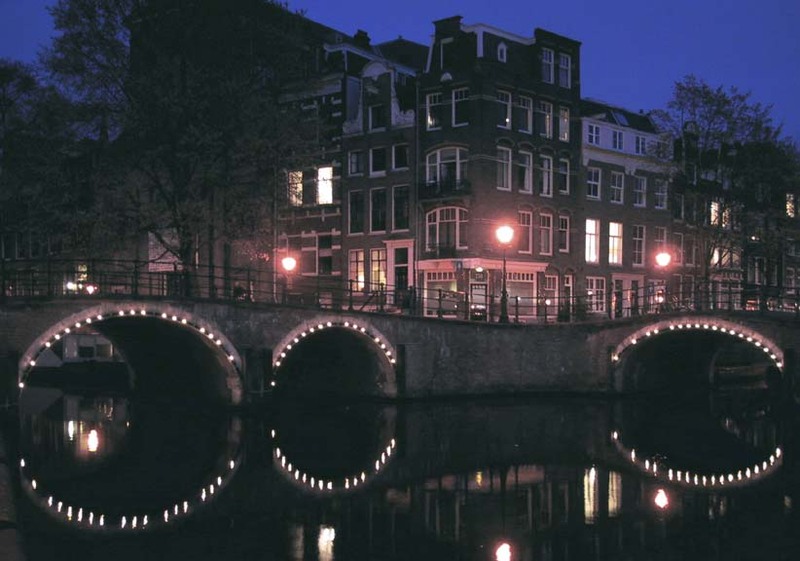 At night, many of the bridges and edges of the canals are lit with small lights. Fortunately, our bikes were also equiped with lights that made it easier to get around after dark. Surprisingly, it felt quite safe being out late at night. I like how this small boy is lost in his own world as he rides across his reflection in the pond. 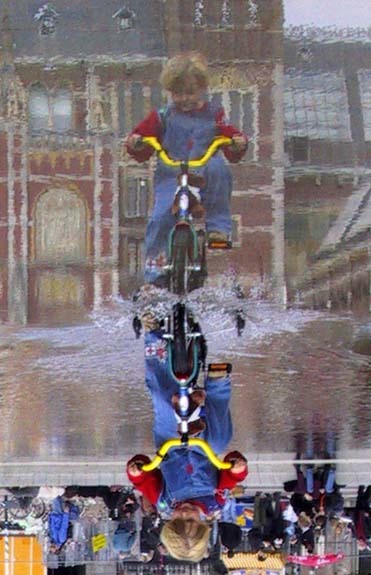 The picture was taken in the reflecting pool behind the Rijksmuseum. The Rijksmuseum contains Dutch art from the 19th and 20th century. We took a train to Haarlem which is about 15 minutes outside of Amsterdam. 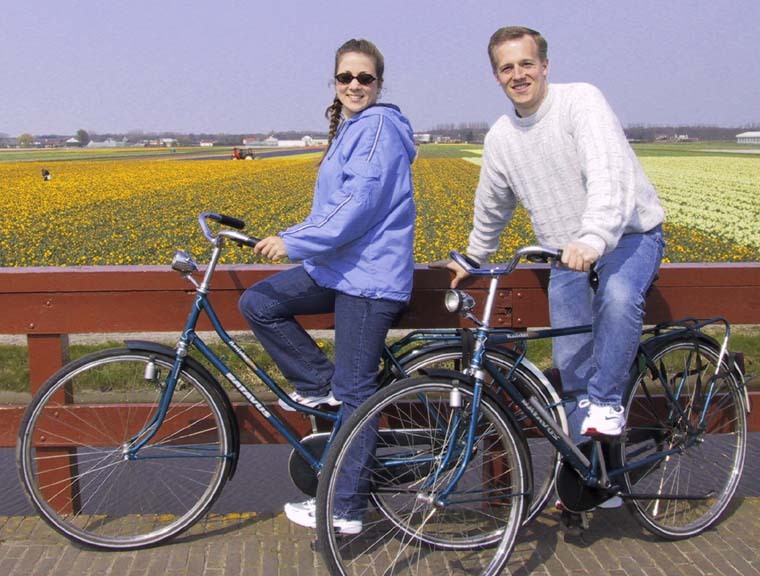 In Haarlem we rented bikes to trek through the tulip fields on our way to Keukenhof. The 20+ mile bike ride was a bit aggressive since the only bikes we could rent were single-speed with pedal brakes and seats that were less than comfortable. But the chance to get off the main roads and pedal through the bulbfields made it well worth the sore butts. 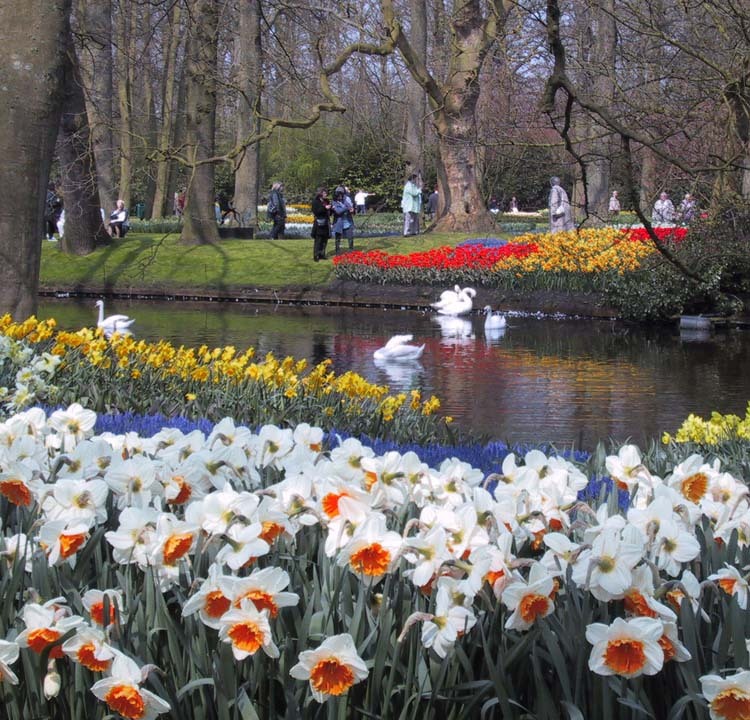 Keukenhof is 70 acres of flower gardens that were set up in 1949 to show off Dutch bulbs. There are over 7 million bulbs planted at Keukenhof. The time period when we visited is the time when the bulbs are typically in full bloom. Holland was just getting over the coldest April in 300 years so many of the tulips were still waiting to bloom. Either way, the sights were incredible. These are examples of just some of the flowers that were blooming in the Keukenhof gardens while we were there. It amazed me that we could smell the flowers from miles away. I guess they were trying to kick the habbit. 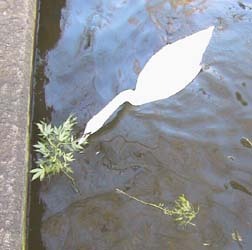 While walking along one of the canals, I came upon a guy and girl who were tossing some sort of plant into the canal. I got a bit closer and, sure enough, it was marijuana. The neighborhood swans and ducks that ate it up probably had no idea what hit them...and their buddies probably had a pretty hard time trying to figure out why they were swimming in circles. 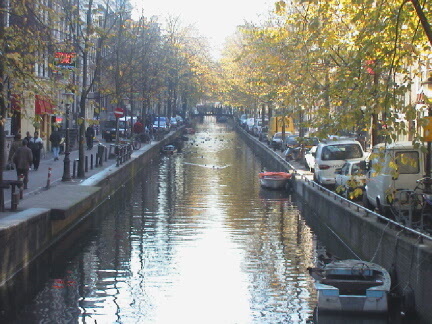 Another typical view along the canals in Amsterdam. The difference is that I took this one in the Red Light District. 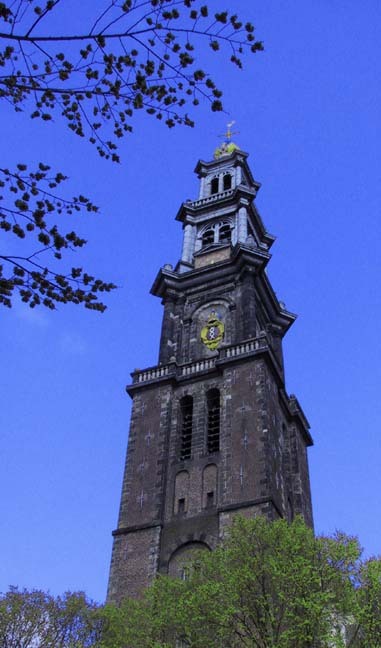 This is the clock tower just around the corner from the Anne Frank house. She talks about it in her diary as she could hear it ring. 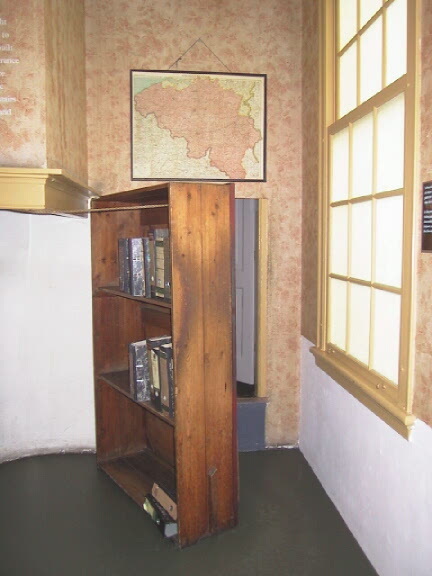 This is the bookshelf which concealed the secret door to where Anne Frank, her family, and others hid when the Nazis occupied the Netherlands. The house has now been turned into a museum which allows you to walk around freely and learn about their stay in hiding. 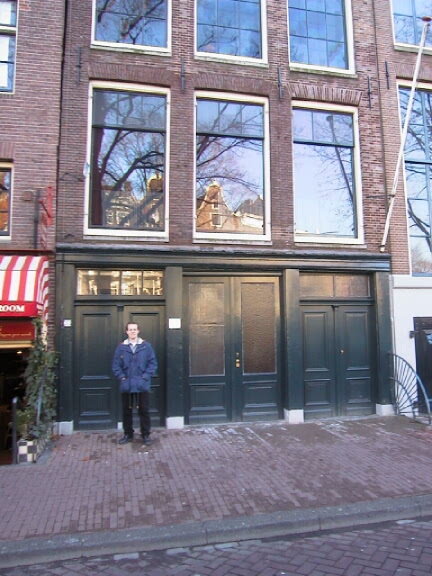 A picture of me standing outside of the Anne Frank House. 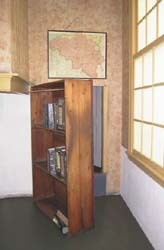 It was recently rennovated to look as acurate as possible to what it looked like during World War II. 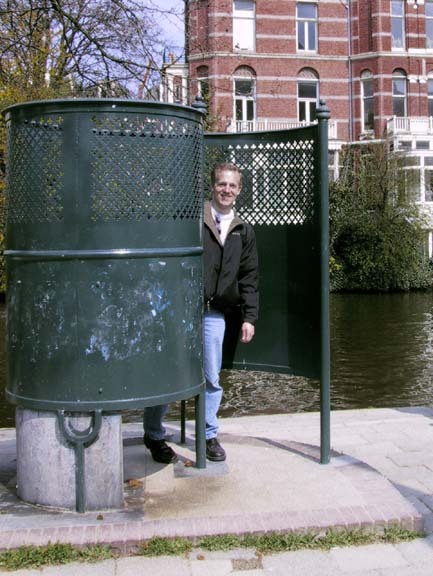 Along the streets there are several of these public toilets. They don't often have the most pleasant smell, but I suppose it's better than the alternative of using the canals.